I started with Jhumpa Lahiri’s Unaccustomed Earth, and I thought the title story was very exquisitely done, so I skipped ahead to the three linked stories at the end. “Once in a Lifetime” was not quite as compelling, but still very well written, and then in “Year’s End,” which like “Unaccustomed Earth” has a second-generation Indian-American coming to terms with a widowed father’s decisions about how to get on with his life, I felt like the subject matter was becoming a little claustrophobic. And then there was “Going Ashore,” which I didn’t much care for—it depends almost entirely on the emotional investment a reader’s made in the previous two stories, and the narrative itself is fairly banal, with an ending that, for all Lahiri’s efforts to pretty it up, seemed gimmicky and exploitative. 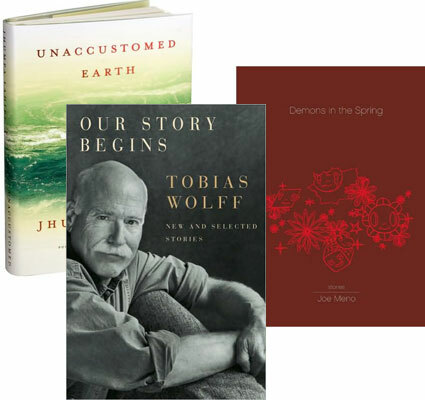 So I moved on to Our Story Begins, a sort of “greatest hits” collection from Tobias Wolff (with a few “bonus tracks” in the form of new stories). And I don’t know quite how to put my finger on it, but while Lahiri and Wolff are both great prose stylists, there was a sense of vitality, of engagement, in Wolff’s stories that resonated a bit more completely with me. It helped that the stories showed a greater range; discovering each new environment brought an exciting edge to the reading. That’s how I felt about Joe Meno’s Demons in the Spring, too—and his range is even further afield, because while Lahiri and Wolff are for the most part solid materialists, even Meno’s most realist stories have a surreal quality to them, and at the end of each story I found myself eager to discover what kind of world he’d go and create next.